Keep your Contact Info Up to Date so members can find you! Current EBA members have access to the EBA’s Membership Online Directory for networking purposes. It’s important that your information is correct and details about your fields of practice or areas of specialization are provided so you can be found by other members! Login to review and update your member data. What is listed in the EBA Online Directory? 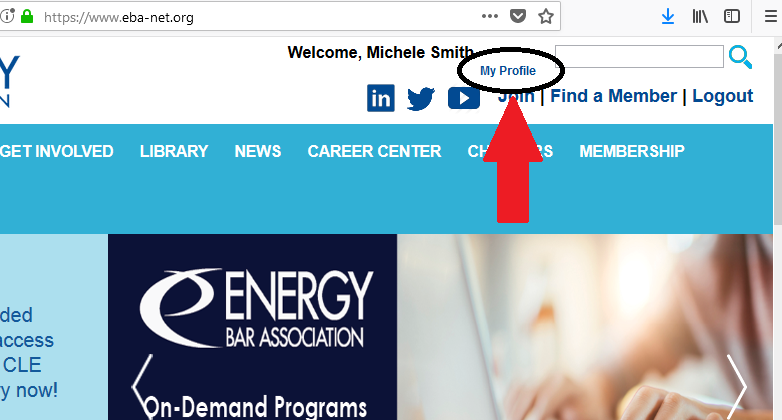 How do I update my EBA Member Profile? Enter your username (your email address) and password. Click on ‘My Profile’ link underneath your name and just above the Join link at the top right of the screen. THEN click on the ‘Social Information’ link/tab and add your Linked In, Twitter or other social media channels. Need assistance? Contact EBA at 202-223-5625 or admin@eba-net.org.